This study used multi-scale models to evaluate spatial variation in the structure of the assemblage and functional groups of gastropods associated with hermatypic corals of the Mexican Tropical Pacific. A geographic model examined the spatial scales of the region, geographic position and sites, while an oceanographic model considered the oceanographic characteristics and sites. The relationship between gastropods and environmental and spatial variables was analyzed with additive partitions, based on canonical correspondence analysis. Both models coincide in that the greatest variation of gastropods was presented at quadrant (i.e., small-scale) and site (i.e., local-scale) levels, and the lowest variation to the scale of geographic position and oceanographic characteristics (i.e., medium-scale). Abundance and Shannon diversity presented greater variation at small and local-scales, while species richness presented greater variation at medium-scale. The functional groups varied to the greatest extent at medium-scale in the geographic model and at local-scale in the oceanographic model. The highest abundance, richness and diversity were found at: (1) Plataforma Pavonas and Túnel Amarradero, ~20°N (Northern region), influenced by the California Current and the Mexican Coastal Current; (2) Caleta de Chon and Morro Potosí, ~17°N (Southern region), affected by the Mexican Warm Pool; and (3) Salchi and Isla Montosa, where relatively high biological productivity occur mainly due to coastal upwelling, ~15°N (Southern region). The carnivorous epifauna was the most important functional group at all studied scales. The most important species in both models were the corallivore Coralliophila monodonta, the symbiont Muricopsis zeteki, Triphora hannai of sandy substrate and Vermicularia pellucida eburnea and Engina tabogaensis of hard substrate. Variation among sites was explained mainly by the coverage of sessile taxa (e.g., percentage of coverage of the coral Pocillopora spp., bryozoans, hydrozoans, octocorals and sponges) and proportion of substrates (e.g., sand, rock, dead coral and rubble). However, at upwelling sites, other variables such as primary productivity and phosphate concentration also contributed to local-scale variation. At medium-scale, oceanographic characteristics explain the variation of the assemblage and functional groups of gastropods. The online version of this article (doi: 10.1007/s12526-017-0780-6) contains supplementary material, which is available to authorized users. Universidad del Mar (UMar) and the Universidad de Guadalajara (UdeG) provided equipment, personnel and facilities for collecting and processing samples. This work was funded by the UdeG (P3E2010 and P3E2011 of FARZ), PROMEP (103.5 / 08/2919 and 103.5 / 10/927 of FARZ) and CONABIO (HJ026 of Calderon-Aguilera LE and HJ029 of ALP). National Parks staff Isla Isabel, Islas Marietas and Huatulco facilities and had given permission to work in the area. Heladio Spíndola, Andres Pacheco, Omar Mendez, Ronald Zepeda (UMar), Arizbeth Alonzo, Esmeralda Ibarra, Ana Barragan, Paola Rodríguez and Amílcar Cupul (UdeG), gave invaluable support during the fieldwork. Sergio Flores Ramírez of the Center for Analysis and Biodiversity Conservation UABCS provided environmental variables. Eduardo Ramírez Chávez of the SIG-UMar, drew Fig. 1. 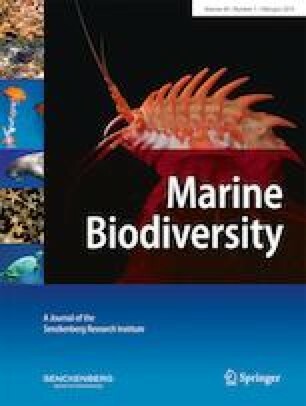 We appreciate the suggestions and comments of two anonymous reviewers and Victoriano Urgorri (Editor, Marine Biodiversity), who helped improve this work. We thank NABL doctoral fellowship PROMEP (103.5/10/5551) and CONACYT (164302) and dedicate this work to Dainzú Leyte-Barrientos.